When I was a kid I used to watch the "Power Rangers" on TV and as any child of the '90s would recall, one would associate themselves with a Power Ranger and their superpower in the fight against villains. I would never guess the new DC production "Shazam!" would take me back to this childish nostalgia, filled with magic and lessons only a child would enjoy. 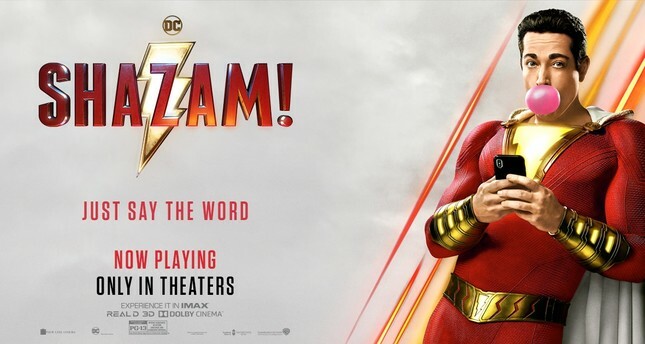 Having hit Turkish theaters on April 5, "Shazam!" features Zachary Levi, Asher Angel and Mark Strong in the leading Roles. Fourteen-year-old Billy Batson is a rebellious orphan who escapes from every foster family he is placed in as he cannot fit into a family due to confidence and attachment problems, although he keeps the "good" in his soul. His life turns upside down when he finds himself in a magical realm while traveling on the metro where he meets an old wizard who seeks to transfer his powers to a good-hearted fellow in the eternal fight against evil. The evil here is the seven sins in Christianity; namely envy, gluttony, greed, avarice, lust, pride, sloth and wrath. The realm of the magic, namely an underground cave, is decorated with statues symbolizing the seven sins, ready be re-animated with the arrival of another chosen hero, but for the evil this time. This anti-hero is Dr. Thaddeus Sivana, who also had a tough childhood, humiliated by his villain father and brother. Here comes the first lesson in the movie: It is up to you to maintain the good in yourself no matter what you go through and only if you are able to avoid the deadly sins. Billy's encounter with the old wizard gives many superpowers like flying and extraordinary strength along with his new body of a bulky man in a red cloak just like Superman, but Billy remains a child in his soul even in a grown body. Directed by David F. Sandberg, the film has failed to explain what sort of powers Billy has, which creates confusion. Nor are the limits of the villain's powers explained, so you are just watching an action-studded fight with no real idea of what it is going on; thus the joy of the challenge is missing in the narrative. When in a dire situation Billy is able to yell "Shazam!" and become a child again, using the advantage of a tiny child's body to escape. The word "Shazam" here stands for the initials of mythological characters Solomon, Hercules, Atlas, Zeus, Achilles and Mercury; known for wisdom, strength, stamina, power, courage and speed respectively. The character building refers to Christian teachings and mythological gods and can be informative for children but I found it boring. The pedantic approach here makes the potential joy of the film go flat. When it comes to acting young Asher Angel has proved his talent with this production. Playing the grown-up hero, Zachary Levi is an experienced actor who has acted in several TV series and movies. However, I found his acting in this movie exaggerated and constrained. I should say the film is more like a parody although it is unintended. Just to compare; Marvel's "Deadpool" was launched as a parody mocking the superhero themes. This one is so loaded with lame moral lessons that I could not refrain from thinking whether it was another parody production. Levi's always-smiling presence, attempting to portray a self-confident hero with a child's mischievous soul irritated me. In Deadpool, it was intentional and necessary to transfer the irony, but here, Levi's acting was nowhere near authentic. All in all, if you are looking for an escape from the daily hustle with some fiction and action, then watch this with your kids. But if you are looking for a good story to enjoy this is not for adult taste.